From a family fishing outing to a real hunting adventure, choices are many and varied in South Canterbury, with stunning mountain vistas a constant backdrop. Rolling hill country and sub alpine wilderness areas are networked by rivers and streams with plenty of wildlife for fishermen and hunters to enjoy. Most hunting and fishing guides also offer high quality lodge, B&B or other accommodation to ensure plenty of rest and relaxation to complement your outdoor activities. Rainbow, brown trout and salmon fishing are popular in high country lakes, lowland rivers and spring creeks. Most of New Zealand’s salmon run is contained within this central South Island area, with the Rangitata Mouth in particular one of the more famous salmon fishing locations in the South Island. For trout, the waters of the Mackenzie country are hard to beat. The trout fishing season runs from 1 October to 30 April (winter and year round seasons apply to some fisheries). The salmon fishing season runs from 1 October to 31 March (searun salmon fisheries only.) 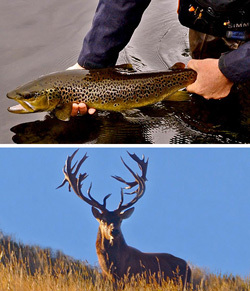 Strict rules and regulations apply through local authority Central South Island Fish and Game, including hunting and fishing season times and licence purchase. South Canterbury’s famous white-baiting season is governed by the Department of Conservation. South Canterbury boasts numerous deer species (red deer, Monarch of the Glen stags, multi coloured Fallow, majestic Wapiti or Elk and the timid and elusive Whitetail), as well as alpine chamois or Tahr. Other popular wild game includes the famous Waimate wallabies, feral sheep, pigs, goats, opossums, rabbits and hares. A variety of waterfowl and peasants can also be sought by the keen hunter. Check with the Timaru or Geraldine Visitor Centres for the latest information on seasons, licenses and guides. Access to private land is by permission only - see listings below for local guides and outfitters who can assist and take you to some of New Zealand's most exclusive and little-known hunting and fishing spots. The Great Outdoors & More in Fairlie exists to provide YOU with the essentials to explore and enjoy this beautiful ‘slice of paradise’ known as the gateway to heaven that is Mackenzie District. Shop in-store or online.